Thick ropes drape from one side of the descending, rocky staircase to the other, making a skimpy barrier across the private part of the history that's been unearthed. And she, in a boldness that stretches beyond the sliver ring encasing her lip and fiery red streaks running through dark hair – she bounds toward the unbeaten path with spirit soaring, freedom brimming, adventure beckoning. 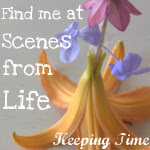 I'm guest posting over at Emily's today, writing one of my very own vivid Scenes from Life. Yes, this story is totally my very own God-ordained love story. Head over to share a moment of my life I'll always remember as one of God being the author of our stories -- even and especially the love ones.